Drums set a grooving beat as the lead guitar begins strumming. The keys chime in with a soulful melody, and anticipation builds as the bass drops a deep rhythm behind the treble hum of the electric guitar. Enter the lead vocals with a powerful opening lyric; then back-up vocalists come in with a sweet layer of harmonies. Behind you, tucked away in the sound booth, is Adam Winter. He makes sure each instrument comes forth with just the right sound as you lean into the music and absorb each lyric without another thought on your mind. He’s been working at this since the wee hours of the morning and will continue until everyone has left and tear-down is complete. Then, he will hop into his 2002 Dodge Neon eager to get home after the long day. Adam’s work as an independently contracted sound technician for Summit Church keeps him driving all over Central Florida between the church’s campuses in Lake Mary, Waterford, and Orlando. Some days he’s on the road for 90 minutes round-trip, including both state roads 417 and 408, on top of a 12 hour day of setting up the stage, mixing the band, and running the sound during the services. If you’ve ever attended a service (or ReGroup or Partnership Class…) at any of the Summit Church campuses, you know the major role music plays in each service, not to mention the value of sound for the ministers. When Adam isn’t at church, you might find him biking Central Florida’s trails or relaxing with his cat, Tux. However, his favorite thing to do is hang out with friends, especially those in his church small group, many of whom don’t live very close to him. 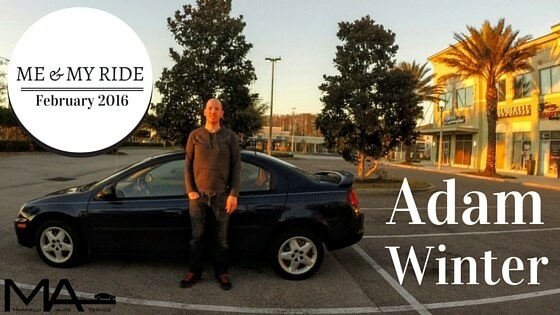 That means more driving for Adam, but he doesn’t mind much because he really enjoys his Dodge Neon. Its small size makes it easily maneuverable and easy to park. I can attest to this as a previous owner of the exact same car. In fact, we both agree that it also has great visibility which, for Adam, is good when he’s driving in heavy traffic on the way to one of his jobs. Adam has little concern over his car except that it would last him a while. “It’s expensive to get another car, especially at the level of the condition of this car,” says Adam. In fact, this past summer, Adam noticed a noise he didn’t think was right…he couldn’t really explain it, but he just knew it wasn’t right. Actually, he thought overall that the car wasn’t running as well as it should be. So, he brought it to Andrew and, after some discussion, decided to get a thorough inspection done of the vehicle in addition to the diagnosis for the mystery noise. So, Adam has taken Andrew’s advice and is slowly checking things off his list as he has room in his budget, starting with repairing the cause of the engine noise. “The car is definitely driving better,” he says. This means a lot to Adam. Prior to coming to us, he would take his car to a mechanic, and they’d give him a list of repairs but they wouldn’t explain it very well. Consequently, he would just put off the repair. Then he’d go back to that mechanic and come home with a different list, again, unexplained to him. Adam is very passionate about his job and the impact it makes on others, even if they don’t see him jamming on stage. We’re glad to know he can be confident his car will get him there.